As much as I love plain dark chocolate, sometimes it’s nice to have a little variety. 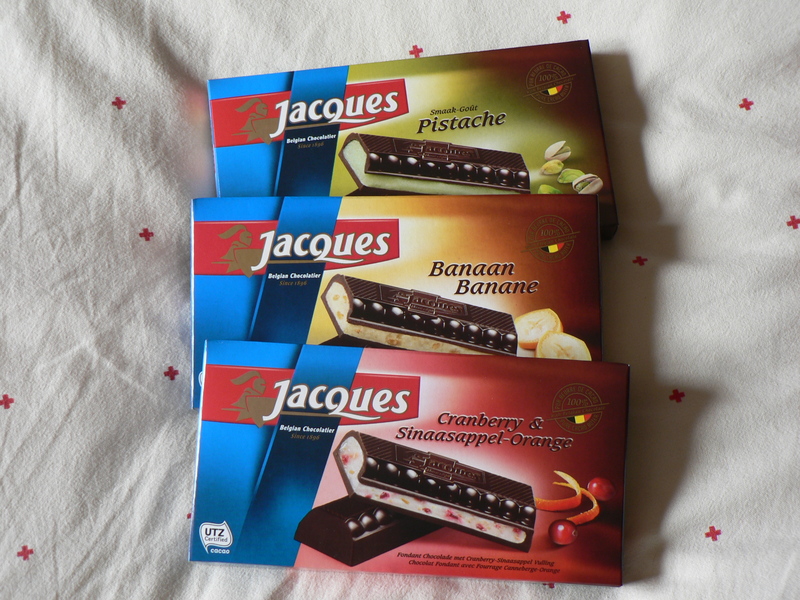 That’s where these Jacques chocolate bars with flavored fillings come in. Oddly, not all of the other varieties of Jacques dark chocolate is vegan (sometimes containing butter fat) but both the dark chocolate and the filling on most of these bars are. I haven’t checked all of the flavors, but I have checked the three pictured here (Pistachio, Banana, and Cranberry & Orange), and the Raspberry and Vanilla ones (not pictured here) and they all appear to be vegan. If I recall, I’ve only run across one that had a questionable ingredient (the Panache, I think, due to an animal based food colorant). [Update: the Panache is vegan! See comments below.] As always, double check the ingredients because companies do change formulation, but check these out when you’re next in the mood for something sweet! You may even discover a vegan flavor I have neglected. The chocolate on these is top notch, but I sometimes find the filling a bit too sweet for my taste. Still, it’s nice for a change of pace, and it’s a nice chocolate to bring to share. These are available at pretty much any supermarket that sells name-brand products. That pistachio bar looks right up my street!